Following my earlier post - I'm adding everything I have discovered, warts and all, about this man who was my maternal grandfather. There are also two other officers mentioned who may be of interest to you - but I've not researched them in any great detail - they are Joseph Schoenfelder and Martin Hayes. 1911 – Married to Theresia Fett – *Joseph Schoenfelder was a witness his father – John – a Farmer – born in England. At the time of his marriage he was living at 48 Edward Street, Regents Park. Martin Hayes age 28 born in Tipperary, Ireland. Joined 11 May 1903 Warrant 89777 and “resignation permitted” on 16 October 1911, not sure which division he was assigned. *Joseph Schoenfelder age 22, born in Lancashire to his German father. Joined 30 June 1910 Warrant 98426 – assigned to S Division. 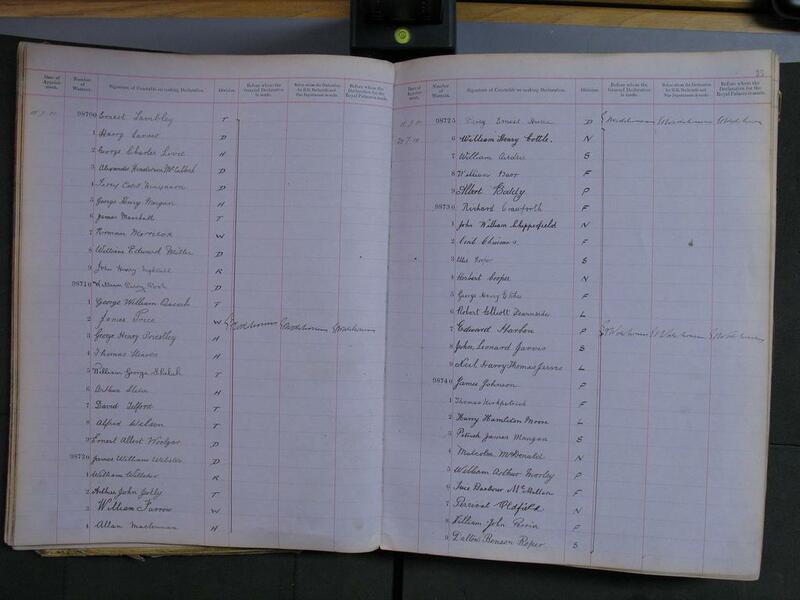 In the ledger his surname was scrubbed through and replaced with Smith and in the remarks is a note “See S (i)” Most likely due to the political climate of the day? 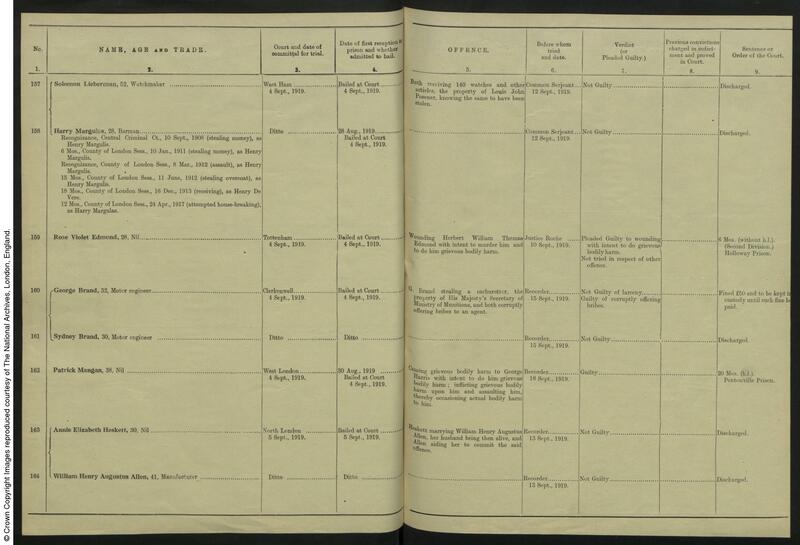 I’ve attempted to find him after that entry in the online MEPO files as either Schoenfelder or Smith and drawn a blank, but there is a marriage record for him with his own surname in 1912 to his wife Emily Froude. 1915 – birth of daughter Mary Veronica Theresa - the birth was registered in Kensington. 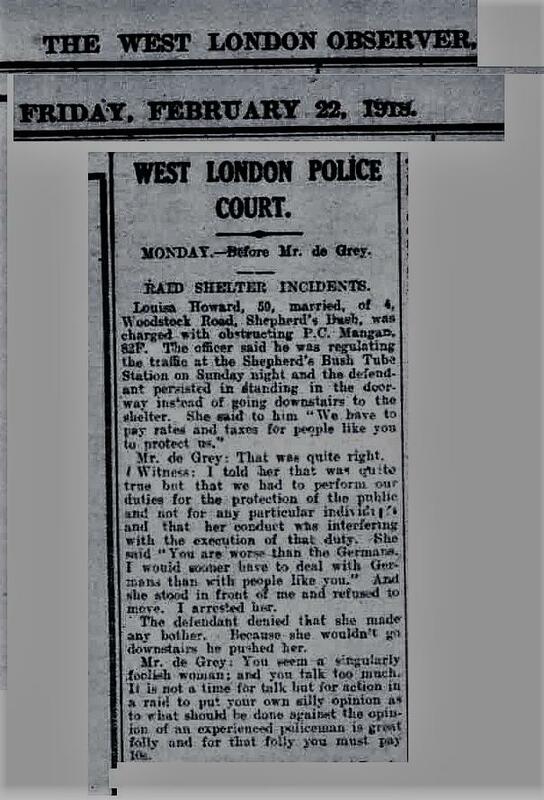 He was transferred to F Division at some stage in his service after being suspended for violently assaulting two men in a pub – this came to light at his court hearing - see newspaper cutting below in 1919. I'm guessing 1915 as Kenley Road address was in F Division area, and the borough of Kensington. I suppose this would have been mentioned in Police Orders of the day - I've yet to research that thought. 1919 August – Patrick was a striker – he defied instructions not to strike for a second time and was dismissed without pension on 1 August 1919. 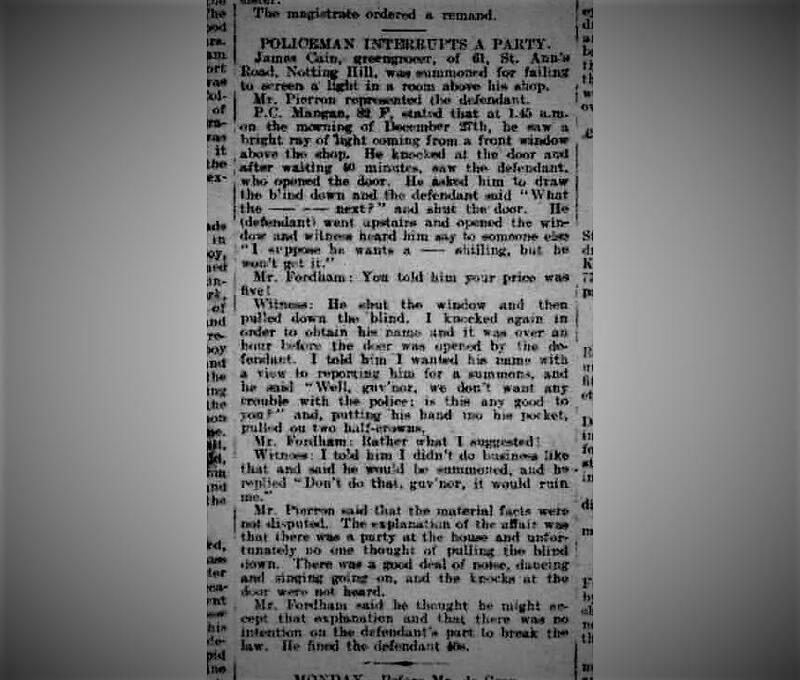 1919 September Patrick was involved in an altercation and subsequent fight with a colleague PC Harris. 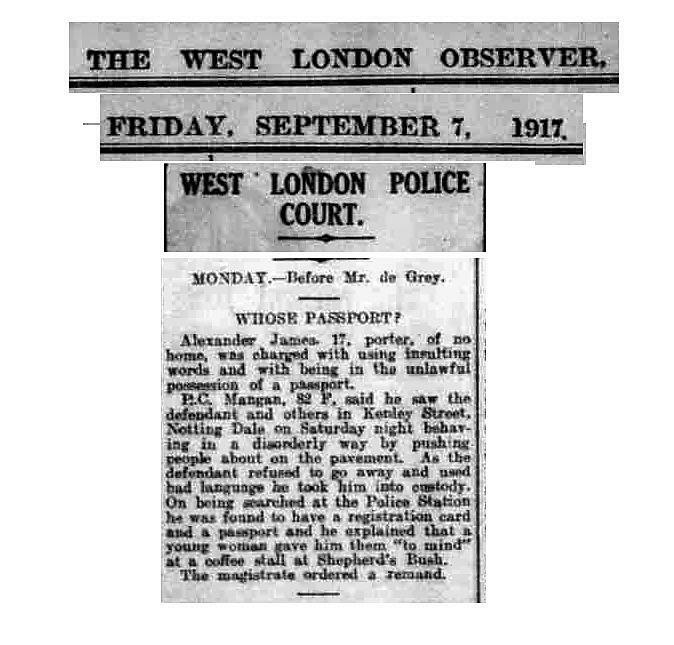 He was found guilty at the Central Criminal Court of GBH/ABH and sentenced to 20 months hard labour in Pentonville Prison. 1922 May – Released from prison and returned to his family 7 Kenley Street, Notting Dale. 1923 – 1932 – lived at 7 Kenley Street, Notting Dale. 1932 – moved to 20 Kenley Street, - his wife and three girls left Patrick and moved to Acton – my mum never spoke about her father, but I have been told that her mum used to send one of the older girls to his place of work (a hotel commissionaire ) on pay day to get some of his wages before he drank them all. 1939 - Moved to 165 Portland Road, Notting Dale – moved there with the Quickfall family. 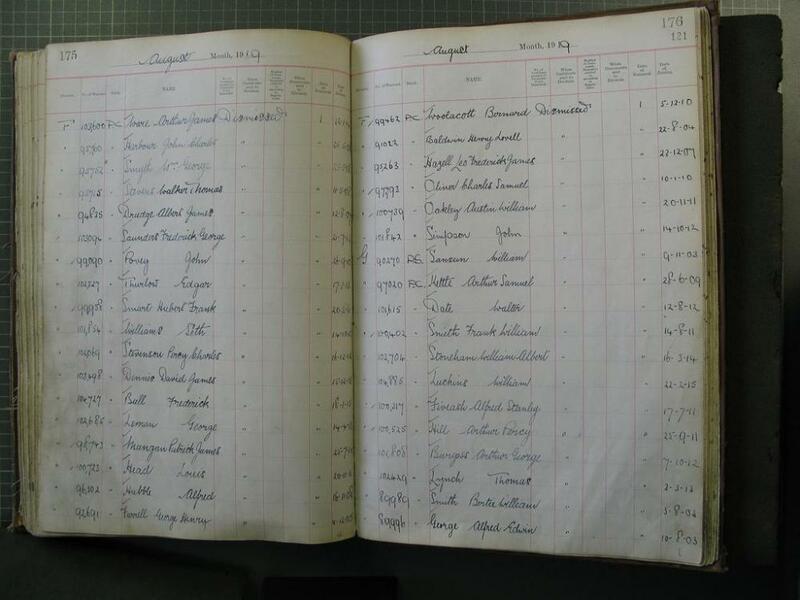 On the 1939 Register his profession is shown as a commissionaire. 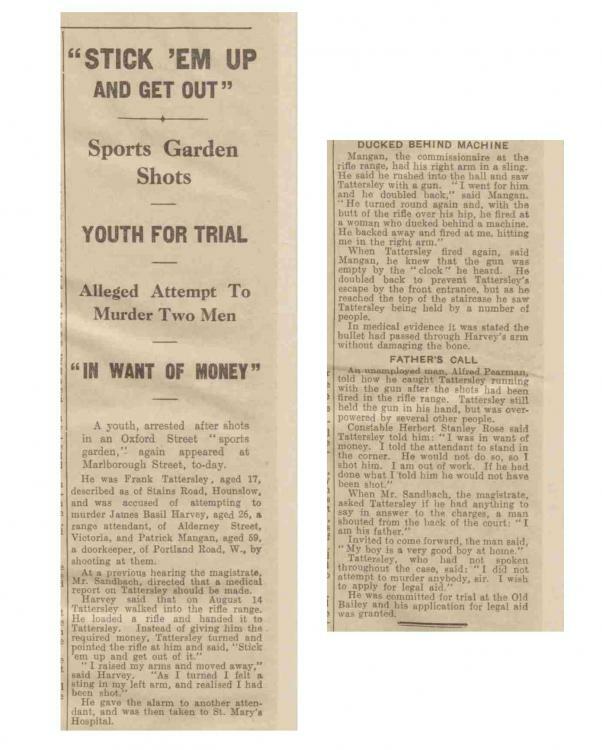 1939 – Patrick was the victim of a crime. 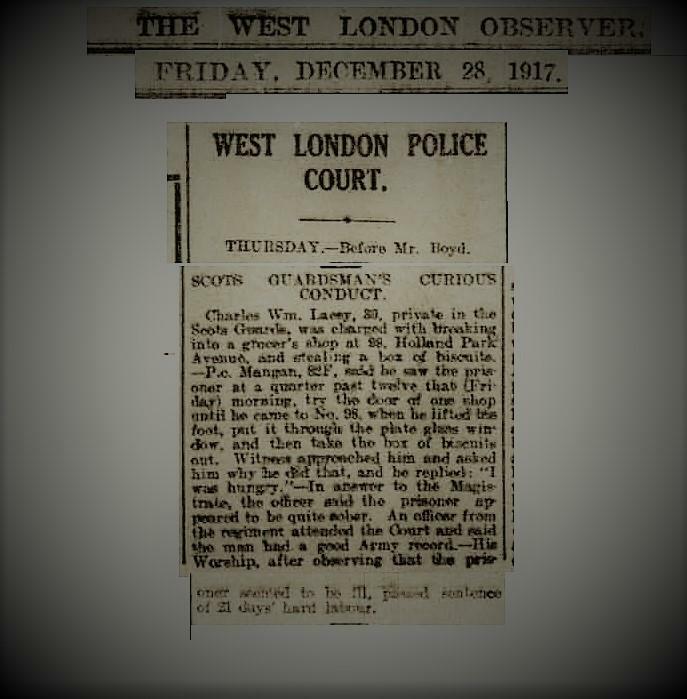 He was working as the commissionaire in the Sports Garden, a basement shooting range in Oxford Street. He helped stop the criminal who used a 22 rifle from the range and tried to steal the takings. Along with another employee they chased the man who shot them both, he was apprehended as he ran up the stairs into the street. 1939 – 1962 … Patrick remained at 165 Portland Road until his death in 1962 and I've not been able to uncover anything about this period of his life, apart from a letter he wrote in 1953 to the editor of a local newspaper, berating his local MP for comments he made regarding the level of the state pension. Apparently the £2 13s 6d he was receiving was a “starvation pension” on which it was impossible to survive! His death certificate, notes him as a retired labourer, it also shows a post–mortem without inquest and his death was reported by the registrar Presumably no member of the family wanted to claim him when he died and I don't know where he was buried, in an unmarked grave no doubt. Also the certificate of marriage for his eldest daughter Mary in 1940 shows him as deceased. 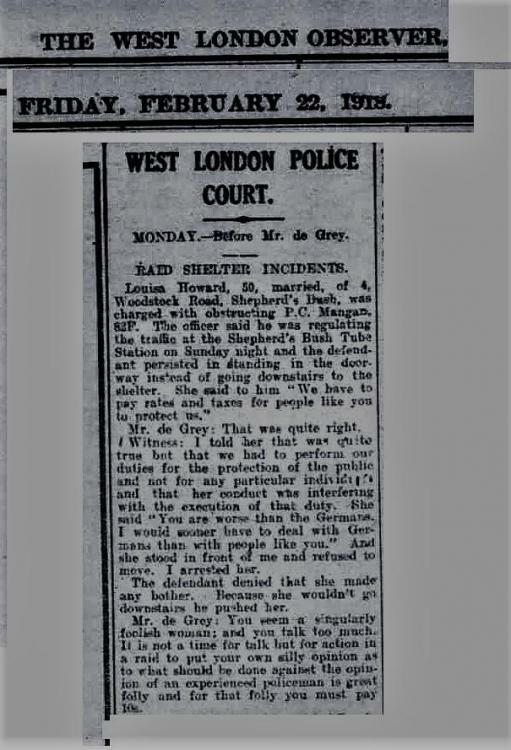 He was however, still alive – she felt so strongly about him, she did not want to acknowledge him on her marriage certificate. So, there you have it - that’s all I know about PC Patrick James Mangan, my grandfather - not really what I expected to uncover and certainly no fond family memories. I still hope to one day find a photo of him and his 1911 medal if its around. Thanks for reading my post, sorry for the ramble. I'd be pleased to hear from you if you can tell me more. Jan, that's very interesting reading!! Thanks very much for sharing it with us!! 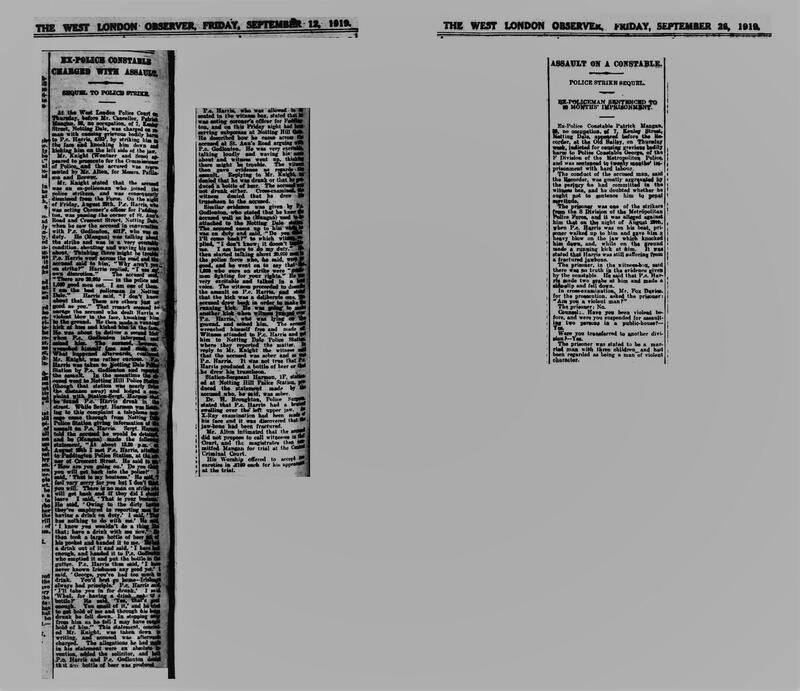 98426 Joseph Schoenfelder Joined 03.05.1910 S Division, retired 09.09.1935 as a District Detective Insp J Division entitled to the 1911 Coronation medal. He changed his surname from Smith. 89777 Martin Hayes Joined 11.05.1903 S Division Resignation permitted on the 16.10.1911 V Division also entitled to the 1911 medal.